how can I fill the field "Award" with the "HSC #number" for all logged HSC members? i tried that with the manual in a post. Go to QSO list window -> Statistics -> Membership tracking -> Rebuild membership statistics. Check Rebuild options for HSC club and click to Start. 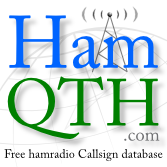 Now all QSO with HSC members will have the HSC number in Award field. However, not all QSO's will have the HSC number in Award field. Many fields remain empty, so that every single entry in the QSO list would have to be edited.